Just because baseball’s not around, it doesn’t mean that the discussion of unwritten rules must similarly disappear. Hockey is still in season, and offers its own array of codes. I’m neither a hockey expert nor particularly inclined to document the ice-bound version of The Baseball Codes, but one incident in particular stood out last week. Whereas many of hockey’s unwritten rules pertain to decorum while fighting, this one was strictly about the lack of respect a team can feel while watching a showboater. After New York Rangers forward Artem Anisimov scored a shorthanded goal against the Lightning, he lifted his stick like a rifle and unloaded a pantomime round into the Tampa Bay net. Whereas the equivalent celebratory action on a baseball diamond might get Anisimov drilled in his next at-bat, the NHL has little need for such restrictions on timing; Lightning captain Vinny Lecavalier quickly went after the Russian rookie, sparking a number of brawls that resulted in a total of 38 penalty minutes—including an unsportsmanlike penalty for Anisimov. It didn’t take Anisimov long to recognize his error. He apologized to his teammates after the game, and to the Lighting the following day. If only all lessons could be learned so quickly. Hey Jason, I’m glad to see you branching out to code/respect transgressions in hockey as well! As post-goal celebrations go, this was very inflammatory. 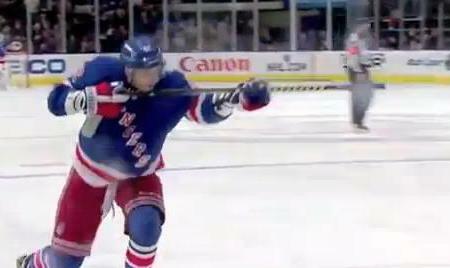 A certain amount of celebrating is allowed, but certainly not the kind of celebrating that Anisimov did. The rifle one is inflammatory is so many ways, especially when you compare it to other goal celebrations (and fight celebrations too) that players considered to be showboating… Alex Ovechkin’s “hot stick” celebration (http://www.youtube.com/watch?v=LCierHHxk9M) comes to mind. Very tame in comparison to this one. Hot stick: Classic. Makes me wish I watched more hockey. I straddle the fence with this stuff; while I enjoy a good end-zone celebration in football, I can’t stand it after a sack or first down. Watching these hockey guys do their thing, I find myself feeling more like I do when it comes to baseball — just do your job and get on with it. Maybe it’s that the end zone is beyond the field of play, whereas all these other celebrations take place where game action had just been and will soon be again — an area that is at least a bit sacrosanct. How you feel about a sack or a first down is how I feel the same about hockey fight celebrations (people pantomiming a championship belt and other types of showboating). Most of the respectable enforcers would fight until they’re separated, then skate quietly to the penalty box without saying a word. The ones that don’t (usually the rookies) get educated pretty quickly. It’s all about respect.